A lot of people who pick up the bass might do it initially with the false belief that bass guitar is easier to play than guitar because it has less strings. In fact, I’ve heard quite a few people actually say this. Maybe that’s true to an extent, particularly when it comes to forming chords, which bass players don’t necessarily do, but it’s not a reason to play bass. Not if you want to excel and become a bass player that stands out among bass players. Those bass players who are considered more than just time keepers understand the value of the bass guitar as an instrument that can not only hold down the rhythm section, but can also become a featured instrument in situations that call for it. Many of these bass players think of the bass as both a rhythm and a lead instrument. Beginner bass guitar lessons are the place to start. You can’t expand the scope of the instrument until you understand the basics. Despite what I’ve said about striving to take the bass places beyond where you’d expect, you need to have the fundamentals of the instrument down first. Fortunately, depending where you are in your learning phase, there are lessons for bass players ranging from the simplest instructions about stringing you bass and caring for it to how to play complex jazz bass or slap bass exercises. In this example, from one of the beginner bass guitar lessons you can find online, we see the major scales laid out in standard notation. If you prefer reading tab, like a lot of guitar players do, you can find your beginner bass guitar lessons written out in tab. The four strings of the bass are the same name as the lower four strings of the guitar (G, D, A, E). They sound an octave lower and are written on the bass clef rather than the treble clef. 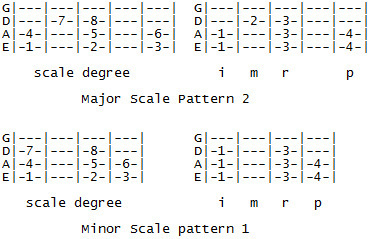 This means scale patterns on the bass will look exactly like scale patterns played on the lower four strings of the guitar. Below is an example of a major scale patterns laid out on the neck of the bass. These are just patterns that can be moved anywhere. 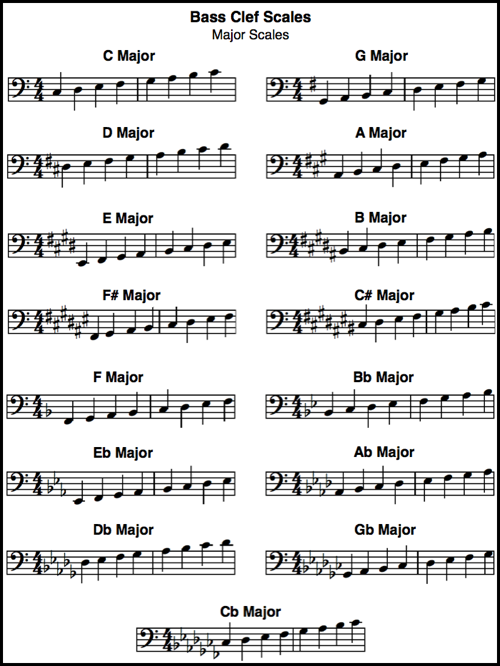 The name of the scale changes depending upon your root note (the note you start with). Beginner bass guitar lessons can also be found on video websites like Youtube, where you can find slap bass lessons and jazz bass lessons. You can also find some pretty cool scale exercises for bass that can increase your speed and dexterity as well as enhance your knowledge of the fretboard. By taking advantage of the Internet and the myriad of bass lessons available, a beginner can quickly become a stronger, more proficient bass player in no time.